England’s 3-0 victory is the first time they have won every Test in a series in Sri Lanka and is only the third time – after India last year and Australia in 2004 – that a touring side have beaten the hosts by that scoreline. 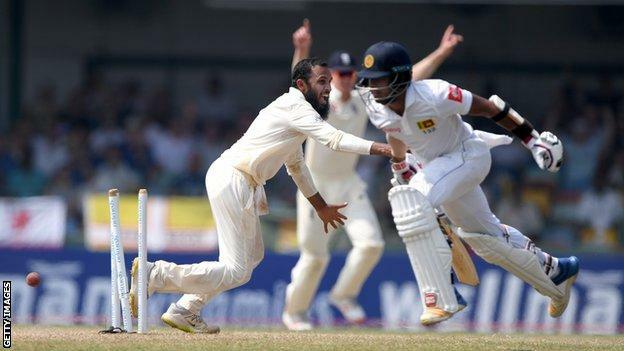 Sri Lanka resumed on 53-4 and, in contrast to their meek collapse late on day three, showed tremendous defiance and skill in threatening to pull off the highest successful chase at the Sinhalese Sports Club. Where Kusal was more positive in striking eight fours and one six, Roshen was his more watchful foil in rotating the strike to disrupt the bowlers, and both batsmen calmly repelled Ben Stokes’ short and fast barrage that had unsettled the top order the day before. With plan B having failed, Root had little option but to revert to plan A and still Kusal and Roshen resisted, bringing up a superb century stand that was only ended by Leach’s stunning throw. When Niroshan Dickwella fell to Leach and Moeen removed Dilruwan Perera and Roshen in quick succession to leave Sri Lanka 226-9, it looked as though England would have victory wrapped up comfortably before tea. Number 11 Malinda Pushpakumara fought back, smacking six fours and a six in a sparkling 42 not out as Lakmal dug in, the Sri Lanka captain also overturning an lbw decision. But Leach stuck to his task, finally straightening one past Lakmal’s defence as England celebrated in exhausted, joyous relief. England’s spinners failed to exploit favourable conditions in the morning, with Adil Rashid and Moeen inconsistent. Leach failed to find his length but was the best of the trio, finally removing stubborn nightwatchman Lakshan Sandakan for seven as he edged to Stokes at first slip. The tourists’ excellent fielding has provided crucial breakthroughs when their bowling has toiled during this series, and did so once again. After tucking Rashid round the corner, Roshen called for a second run as Leach ran in from backward square leg, gathered and hit middle stump with a tremendous throw, leaving Mendis short of his ground at the non-striker’s end. A beaming Leach had bowled well after lunch and was now regularly finding the edge of the bat, getting Dickwella to play back and flicking it off his thigh to Keaton Jennings at short leg for 14. Jennings then claimed his sixth catch of the Test with a fine low take to dismiss Dilruwan for five off a renewed Moeen, who also trapped Roshen lbw, before Leach fittingly finished it off with the 100th wicket to fall to spin in the series. England captain Joe Root told BBC Sport: “It has been a fabulous tour. It has been a complete team performance throughout the whole trip. 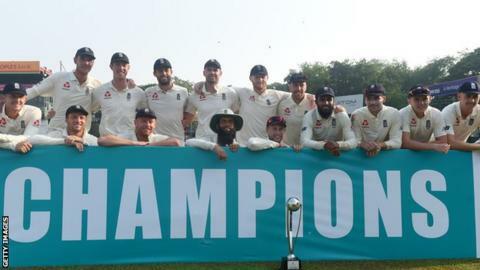 Completing a 3-0 series win in Sri Lanka marked an impressive reversal for England’s Test team after a torrid start to the year. They were heavily beaten in the fifth Ashes Test as they lost the series in Australia 4-0, and were then bowled out for 58 during a series defeat in New Zealand. England were thrashed by Pakistan in the first home Test of the year at Lord’s, but responded by winning the second Test, then secured a 4-1 series victory over world number one side India. A new England has started to take shape this year – Sam Curran has turned several matches with bat and ball at just 20 years old, Jos Buttler and Rashid have proved the merits of their respective recalls, and Root continues to mould this side in his image as they move on from Alastair Cook. England still have issues to resolve and only three Tests against West Indies and one against Ireland in which to do so before their attempt to regain the Ashes at home starts on 1 August 2019. Coach Trevor Bayliss said Jennings and Rory Burns have done enough to retain their opening spots, but Jennings has failed to dispel the notion he is vulnerable to pace bowling and both need runs in the Caribbean to cement their places. Having three spin options is a virtue, although questions remain over who is first choice. Leach, Moeen and Rashid have excellent qualities, but all can be inconsistent and England will not pick all three in English conditions next summer. However, England generally have fewer of those questions than they did coming into this series.